10 - 30 Yard Dumpsters Starting At $225.00 No Delivery/Pick up Fees! No Fuel Surcharges! Same Day Drop Off If Called In Before 10am! With more than 45 years of combined industry experience, the team at Liberty Hauling Services has the right equipment, knowledge and experience in the field necessary to ensure a smooth and seamless rental process. We’re a proud family owned and operated business based in Oviedo and serving all of Central Florida. We accommodate residential and commercial customers, and we offer 24 hour availability. Whether a household cleanout or emergency situation, Liberty is here to help with your dumpster rental in Orlando FL and outlying areas. Liberty is well-equipped and experienced in handling insurance claims, working with contractors, residential delivery/pick-up, estate cleanouts and much more. 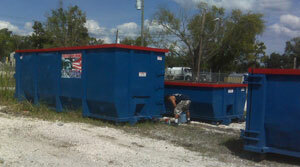 We’re Orlando’s premier source for cost-efficient and responsive dumpster rental! Liberty has the right equipment to accommodate even the biggest cleanups. We carry 10, 20 and 30 cubic yard dumpsters of varying dimensions. We have what you need no matter the situation, such as limited space, need for multiple dumpsters, container swap-outs, containers with shorter walls for easy side-loading, and more! Is a 10 yard bin the right option or should I go with a 20 yard container? It’s a common question asked by customers, and we’re happy to help you answer it! Give us a call to discuss your project. Our 10 yard dumpster is a cost-effective option that is able to handle around 5 pickup truck loads worth of waste and debris. Step up to our full-size 30 yard box and get the capacity to hold up to 15 pickup truck loads worth of waste, junk and debris. Type of waste, junk or debris. Why does the type of debris matter? Some debris, such as concrete, is best loaded in smaller containers, such as 10 yarders, due to the heavy weight. The same holds true for other heavy, dense wastes, like roofing debris and dirt. We’ll help you every step of the way if you’ve never rented a dumpster before. Liberty is committed to meeting our customer’s needs, and we go the extra mile to ensure complete customer satisfaction.